Greytip Online Payroll is a product of 15 years of HR/payroll software experience. It contains best practices of hundreds of HR and payroll professionals. The features have been fine-tuned and made more useful to you with regular feedback of experienced practitioners at blue chip companies in India. Payroll Processing: Fast and accurate payroll processing; handles all aspects of payroll management. Statutory Payroll Reports: Get professional statutory payroll reports for PF, ESI, profession tax, income tax, etc. Form 5, Form 10, Form 16... name it, we have it! Leave Management: Manage employee leave balances, leave grants & year end processing. 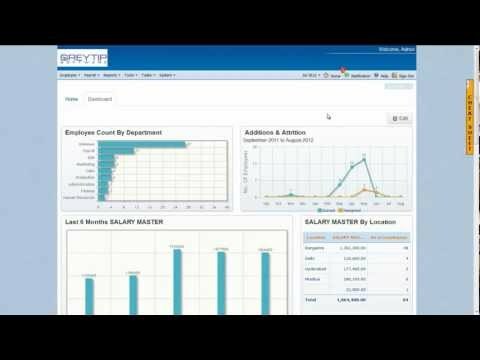 Integrated with payroll for work days computation. Excel Import & Export: All data can be imported using Excel spreadsheets. Export information to Excel, PDF or Word. Payroll Reconciliation Tools: Variety of reports & tools to verify accuracy of payroll. Compare payroll numbers from previous to this month. Reimbursements & Loans: Track payroll reimbursements like medical & LTA. Automatic loan deductions during payroll processing. Strong Security: Greytip Online is highly secure and offers SSL, role-based access rights and password policies. Greytip Online Payroll is also an ideal platform for Payroll processors. It enables them to deliver high-end services to their client at much lower costs and efforts. Software by Greytip Software Pvt. Ltd.
1. Helps with proper payslip/paystub. 2. Its smooth functioning feature is gem of this software. 3. Helps with taxation. 4. Flexible with required changes. 5.Maintains leave records. 6. Provides contact information for the employees so as to connect easily in case of emergency. 7. Helps to maintain Loan deductions and Reimbursements . 8. Proper reconciliation of yearly payslips can be done easily. 9. Loan Statement and Salary revision can also be reconciled. Sometimes, there is issue while logging in to the online portal of greythr, otherwise it is a good user-friendly software. This software is best for Indian company ,it has all features like payroll,leave management,Attendance management,Performance management. We are using this software from last 4 years .Employees can see all details payslip ,ITR and Requirement slip by self login. There are many reports in to software some of them are duplicate ,Expanse module need to updated,it has lots of bugs. we can print payslips in very easy way and also create report of form 16 in very less time. Creation of report is also easy. we can track the leave also. Every feature in this software is super. I don't feel any like least in this software. Thanks, developer for creating such wonderful software. Greytip Online is offered on a monthly subscription basis based on the employee count of your organization. Various add-on modules are available for a small incremental costs. 100% compliance in terms of PF, ESI, PT & TDS. Accuracy: Be assured of accurate payroll processing, month after month. 100% Statutory Compliance: You need not worry about wrong payroll deduction of PF, ESI, income tax, etc. Avoid paying hefty fines and back billing. Zero upfront cost: To use Greytip Online Payroll, you only pay a small monthly fees. There are no other costs or setup fees. It's all hosted: No software to buy, no installation required. You don't need to buy servers or have trained IT manpower. You also get automatic updates and bug fixes. Data Safety: An automatic daily backup is an added advantage. Small businesses can have a relaxed approach on their data backup and disaster recovery procedures. Prevent Fraud: Extensive reconciliation reports, audit trails and comparative analysis helps prevent payroll fraud. Process Maturity: Using a payroll software helps standardize your systems, improves processes and reduces work. Access from anywhere, anytime: Multi-location, multi-company organizations can benefit from centralized payroll processing at one location. No lock-in - Download data anytime: Your data is entirely your property. You can download all your data anytime you want - daily, weekly, monthly, etc. You will always have the data whether you use our service or not. Below are some frequently asked questions for GreytHR. Q. What type of pricing plans does GreytHR offer? Q. Who are the typical users of GreytHR? Q. What languages does GreytHR support? Q. Does GreytHR support mobile devices? Q. Does GreytHR offer an API? No, GreytHR does not have an API available. Q. What other apps does GreytHR integrate with? Q. What level of support does GreytHR offer? Q. Which apps is GreytHR compared to most often?